With a purpose-built lakefront chapel, this modern, chic and elegantly understated Distinction Hotel offers you a luxurious 4 star all in one wedding location, including ceremony, reception and accommodation. 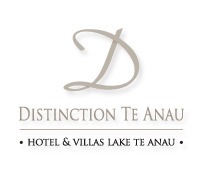 Distinction Te Anau Hotels and Villas will create a wedding that is uniquely yours. Scroll down for more information about holding your wedding at Distinction Te Anau Hotel & Villas or feel free to visit our comprehensive Te Anau weddings website. For a gorgeous and romantic lakeside wedding, exchange your vows in Distinction Te Anau's purpose-built, waterfront glass chapel. With luxurious hotel rooms, large reception venue, a range of wedding packages and a dedicated wedding specialist to cater to your needs, let us help to make your special day a fairytale.